Dolphins GM Jeff Ireland says he has a "high, high degree of excitement for" Lamar Miller and Daniel Thomas. Most, if not all, of Ireland's excitement should lie with Miller, the No. 97 overall pick in last year's draft. We already know what Thomas is, and he's a fumbling, concussion-prone, straight-ahead plodder who has averaged 3.5 YPC on 256 career carries. Miller is expected to get every chance to win the starting job this summer, and it would be a disappointment if he didn't succeed. 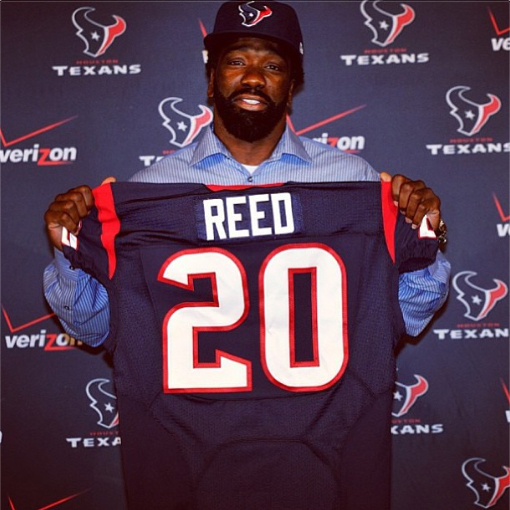 Ed Reed officially became a Houston Texan on Friday. An era in Baltimore has ended. After the wax on the contract seal dried, Reed joined Glenn Younes. Reed spent eleven seasons in Baltimore, and set a precedent for future players at his position posting 61 interceptions in Purple. He also holds the record for most INT return yards in history with 1,541. The All-Pro safety will continue to support Baltimore. His Foundation has several events still scheduled in Charm City. “The Eye of the Hurricane” focuses on helping youth realize their full potential, even those of lesser means. After the interview, there were an overwhelming number of texts and calls in support of Ed Reed. Baltimore will miss him, and Reed will miss Baltimore. 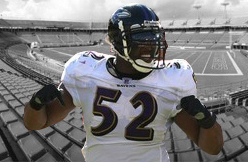 The epilogue of that book will be written in Houston, but number 20 will be forever remembered as a Raven. He leaves Baltimore with no hard feelings, and nothing but love. Good luck as a Texan, and retire a Raven. The Bears are gambling that troubled D.J. Williams, a first-round pick in 2004, can replace eight-time Pro Bowl middle linebacker Brian Urlacher — at least for this year. It's a fairly safe financial bet for the Bears because none of the money in Williams' $1.75 million ($900,000 base), one-year deal is guaranteed. The former Broncos starter, 30, will have to avoid additional transgressions to get paid and get his career back on track. He was suspended for nine games last season, losing six games for violating the league's policy on performance-enhancing drugs and three additional games for a second arrest on charges of driving while ability-impaired. The 6-foot-1, 242-pound Williams was due to make $6 million if the Broncos, who drafted him 17th overall, had not cut him last week. He started just one game last season and played in only seven. 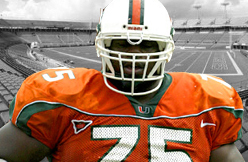 But the former Miami Hurricane has started 115 games in the NFL, at weak-side, strong-side and middle linebacker. He's expected to play in the middle for the Bears. "We are happy to welcome D.J. to the Bears and are excited to start working with him," Bears general manager Phil Emery said on the team's website. "This is a great opportunity for D.J. to restart his career after coming off suspension. "We see a player that has very good athletic upside who can contribute immediately at Mike (middle) linebacker. He is also a versatile player who has played both outside linebacker positions, giving us flexibility in the draft." Along with quarterback Jay Cutler and receiver Brandon Marshall, Williams is the third former Denver starter to join the Bears. While he lacks Urlacher's size, Williams has excellent range and instincts, which allow him to make plays sideline to sideline in the running game and to be effective dropping into pass coverage, an Urlacher strength when he was in his prime. Urlacher and the Bears decided Wednesday to part company on less-than-ideal terms when the team refused to offer him more than $2 million on a one-year contract. Urlacher said it was only "30 seconds" after his agent was told by the Bears they would not re-sign him that the team announced it on Twitter. "I would have appreciated a call from, maybe not (general manager) Phil (Emery), but (team chairman) George (McCaskey) or somebody else I've been around," Urlacher said Friday on "The Waddle & Silvy Show" on WMVP 1000-AM. "I haven't been around Phil; he's been here for one year, so I don't know him all that well, but (a call) from somebody else in the organization I've been around for a long time (would have been nice)." From 2004-11, Urlacher had 601 tackles, according to STATS LLC; Williams had 611, the most in the NFL. Both players had 20½ sacks over those eight years, and Urlacher had 50 stuffs, while Williams had 41½. A stuff, according to STATS LLC, is a tackle for no gain or a loss. Only three players had 600 tackles, 40 stuffs and 20 sacks from 2004-11. The other was Karlos Dansby, who was cut by the Dolphins last week. The Bears are still expected to give serious consideration to selecting a linebacker in the draft. Weak-side linebacker Lance Briggs is 32, Williams is 30 and the Bears have lost linebackers Nick Roach (to the Raiders) and Geno Hayes (Jaguars) in free agency. New England Patriots offensive tackle NATE SOLDER and defensive tackle VINCE WILFORK will each donate a $1,500 equipment grant to a high school football program through USA Football, the official youth football development partner of the Patriots and the NFL. USA Football named Solder and Wilfork to its 2012 All-Fundamentals Team in January, honoring 26 NFL players who employ proper technique, particularly when blocking and tackling, which fosters inherent safety benefits and better on-field performance. As All-Fundamentals Team players, Solder and Wilfork each received an equipment grant valued at $1,500 from USA Football to donate to the youth or high school program of their choice. 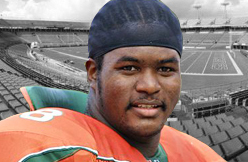 Soldier will award his grant to Buena Vista (Colo.) High School, his alma mater, and Wilfork will award his grant to Boynton Beach (Fla.) Community High School. Solder uses proper footwork and balance to correctly and efficiently block in space. With eyes on the target, Solder uses a wide base, a bend in his knees and great body position whether leading on run or screen play or setting up in pass blocking. "The equipment grant will help us replenish our helmet inventory," Buena Vista High School football coach MATT FLAVIN said. "The new helmet law in Florida requires any helmet over 10 years to not be re-conditioned. Our football program appreciates the support of Nate, USA Football and the Patriots." Wilfork uses his strength and proper technique to either defeat blocks or hold his ground at the point of attack, depending on what his team’s call is. His balance and proper hand placement create space between himself and the blocker to remain in control while engaged. "The USA Football equipment grant from Vince Wilfork will greatly benefit our football program," Boynton Beach Community High School football coach RICK SWAIN said. "Vince grew up in Boynton Beach and understands the financial struggles our school, students and community faces. "This type of donation – a 25-piece blocking equipment set – will directly impact our student-athletes and inspire them to be the best they can be." Employing core football fundamentals advances a youth player’s performance and safety, particularly in the areas of blocking and tackling. USA Football has educated more than 100,000 youth football coaches in all 50 states and Washington, D.C., through its online courses and single-day coaching clinics. Approximately 3 million American children age 6-14 play organized tackle football, placing it among the country’s most popular youth sports. More on past USA Football All-Fundamentals Team players’ techniques is available at: www.usafootball.com/all-fundamentals-team. About USA Football: USA Football, the sport’s national governing body in the United States, hosts dozens of football training events annually offering education for coaches, skill development for players and resources for youth football league commissioners. The independent nonprofit is the official youth football development partner of the NFL, its 32 teams and the NFL Players Association. USA Football manages U.S. national teams within the sport for international competitions and provides more than $1 million annually in equipment grants and youth league volunteer background check subsidies. Endowed by the NFL and NFLPA in 2002 through the NFL Youth Football Fund, USA Football (www.usafootball.com) is chaired by former NFL team executive Carl Peterson. After leaving the Ravens and signing with the Texans, Ed Reed said this offseason has been a wakeup call for him in learning about the business of the NFL. Reed said on 105.7 The Fan in Baltimore that he believed after the Super Bowl that the Ravens would be able to keep the nucleus of their championship team together. It was disappointing for Reed to come to the realization that the Ravens were undergoing a major roster shakeup. Reed has handled his departure after 11 years in Baltimore with class, but this is a disappointing time for him. Every star player eventually comes to the realization that as he gets older he gets easier to replace, and for Reed, that realization came when the Ravens let him walk. OWINGS MILLS, Md. -- This was the game the Baltimore Ravens have wanted for 12 months. Now that they've got an AFC Championship rematch with the Patriots, linebacker Ray Lewis said if they don't come away with a win, everything they've done to get to this point will be irrelevant. "If you write it up, there's no better way to write it up," he said. "We all felt the same way leaving there last year. We had an opportunity to win that game, and what better way to go back to the Super Bowl than to go back at New England again?" When they left Gillette Stadium after losing last season's AFC Championship game by a wayward field goal attempt, every Raven was in disbelief and disarray. Kicker Billy Cundiff was shell-shocked. Defensive lineman Terrell Suggs was dumbfounded. Quarterback Joe Flacco was unsatisfied. Lewis, as usual, was inspirational, telling his teammates they would be here again. "I just think going back to last year, we made up our mind that that wasn't it for us," Lewis said. "That's just kind of how the seasons go. For us to be back here again, same position, same situation, who would have ever thought of it?" This will be the third time the Ravens and Patriots have faced each other in the playoffs since 2010. "We know each other very well," Lewis said. "And every game we play is always those classic games that come down to that last play, that last drive." DERRY, N.H. — Vince Wilfork’s mission to raise awareness in the fight against diabetes led to a New Hampshire middle school yesterday. The Patriots defensive tackle teamed up with U.S. Sen. Jeanne Shaheen and several medical experts at Hood Middle School, and preached the importance of living healthy, active lives now to lower the chances of developing diabetes later. A handful of diabetic children in the crowd were there, including twin boys in the eighth grade who were curious about the disease’s effects in adulthood. Wilfork, standing in the middle of a packed gymnasium, told them to appreciate everything in the present and follow proper medical orders to live the fullest lives possible. 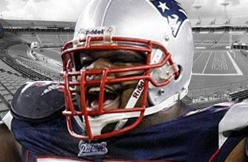 Wilfork saw firsthand how devastating the illness can be. His father suffered from diabetes for years before losing the battle in 2002, and he recalled instances as an adolescent when he had to take care of his father while friends played outside. 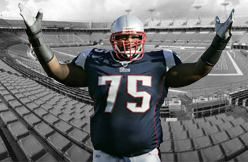 Wilfork now has made it his lifelong mission to fight the disease. Shaheen’s granddaughter, who attended yesterday’s event, also has diabetes and recently got a guide dog that can actually help by sensing when her blood sugar levels aren’t right. “Anything I can do with this whole diabetes thing is something near and dear to my heart, also to the senator’s,” Wilfork said. “Anything I can do to help, I’m always on board for it. Today was one of those days that had nothing to do with nothing but being a human being and helping one another. That’s what we did today. Hopefully these kids listened to what we had to say, take our advice. They have a bunch of support around them, and we just hope that they use it. If they do, we’ll definitely have a better place. Wilfork will host his 10th Draft Night Fundraiser on April 25 at Pinz in Milford, and it will again support the Joslin Diabetes Center and Diabetes Research Institute. ORLANDO — Last year it was Dwyane Wade versus Udonis Haslem and Mike Miller. 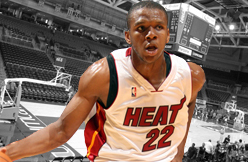 This time, Wade is up against James Jones. For the second consecutive year, Wade's collegiate team will face the alma mater of a teammate in the NCAA Tournament. It happens when Marquette plays the University of Miami on Thursday in the Sweet 16. "Me and James are going to have a lot of dialogue over the next couple days, I can tell you that," Wade said. "It's great. First of all, for Miami I'm very excited for Coach (Jim) Larranaga and that program and what he was able to accomplish. That's a very good team over there." With that said, Wade is banking on the Golden Eagles collecting a victory. Last year they fell to the University of Florida, where Haslem and Miller played. "I'm excited for Marquette to be back in the Sweet 16 again," Wade said. "I don't want my team to be satisfied with that. I feel like we've been there the past three years. We haven't done anything. I look for good basketball. Obviously, I want Marquette to win but good luck to Coach Larranaga and 'The U.' It's special. Whichever teams wins, deserves it." Jones sounded the more confident of the two. In the past, the Heat players have made friendly side bets during the tournament. Jones said there is no need. "Either way, it goes we're both excited that both teams will be there," Jones said. "But a victory for me is the only thing that matters. There is no side bet. I don't even think it's fair because I think my team is going to win anyway. Knowing this going in, it wouldn't be right for me to bet him anything." San Diego Padres 1B Yonder Alonso (hand) was hit on the hand by a pitch in the Cactus League spring game Tuesday, March 26, and his hand was swollen. Fantasy Tip: After the game, Alonso said he could grip a bat, so it appears he dodged a more serious injury. He remains a decent low-end 1B or CI in deeper NL-only fantasy leagues heading into the regular season. 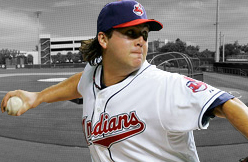 GOODYEAR, Ariz. -- Chris Perez was in a good mood Tuesday afternoon. He was holding a Gatorade paper cup in his teeth, while catching baseballs dropped by fans from the right-field wall at Goodyear Ballpark. Perez would catch the balls, autograph them and flip them back to the fans. It went on for about 10 minutes before he opened a door in the right field wall and disappeared. 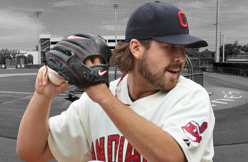 The Indians closer, appearing in his first Cactus League game since Feb. 26, pitched a scoreless seventh inning in a 7-6 loss to Oakland. It was the latest indication that he'll be ready for the season opener Tuesday in Toronto. "I felt normal," said Perez. "Now I'm just trying to get up to speed with my location. Velocity wise I felt normal. "The big test will be going back-to-back during the season. Honestly, I feel better than I did at this time last year." Perez made only three Cactus League appearances last spring because of a strained left oblique muscle. "He looked good, really good," said manager Terry Francona. "He said he felt rusty, but it didn't look like it. That was the highlight of the day." Former Ravens safety Ed Reed's three-year, $15 million contract with the Houston Texans includes a $2 million signing bonus, according to a league source with knowledge of the deal. The deal includes $6 million in guaranteed money. The former NFL Defensive Player of the Year's $1 million base salary in 2013 is fully guaranteed for skill, injury and cap. Reed also got a $1 million roster bonus this year. There's a $2 million guaranteed base salary advance in the first year of the deal. In 2013, he has a $3.333 million salary-cap figure. In 2014, he has a $4 million nonguaranteed base salary and a salary-cap figure of $5.33 million. In 2015, he has a $5 million nonguaranteed base salary and a salary-cap figure of $6.33 million. 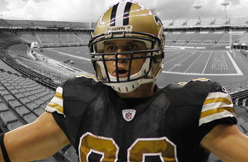 The New Orleans Saints apparently view tight end Benjamin Watson as something more than just a backup. The proof is in his pay. In a twist of fate, Watson will make more than $700,000 more than what starter Jimmy Graham does in total cash this year. According to numbers obtained by ESPN.com, Watson will earn $2.15 million this season, while Graham will make $1.323 million in 2013. Anyone else out there thinking about a possible holdout by Graham if he doesn’t get an extension (and a big raise) of a rookie contract he clearly has outplayed? For the record, Watson’s three-year deal is worth $4.95 million. He got a $1.2 million signing bonus and a $950,000 first-year base salary. Watson’s 2014 salary jumps to $1 million and he has a $250,000 roster bonus and a $50,000 workout bonus. In 2015, Watson’s salary will be $1.2 million and he also will have a $250,000 roster bonus and a $50,000 workout bonus. I’ve also obtained the numbers on some other contracts recently signed by New Orleans players. Receiver/special teams player Courtney Roby got a one-year deal worth $905,000. But the Saints designated Roby as a veteran minimum benefit player, meaning his cap figure for this year is just $555,000. The Saints did a similar maneuver with linebacker Ramon Humber. His one-year deal is worth $740,000. But the veteran minimum benefit puts his cap number at $550,000. According to my calculations, the Saints are roughly $3.3 million under the cap. 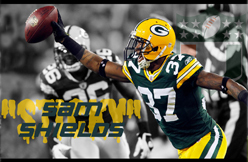 Green Bay — There will be no guarantees at cornerback for the Packers in 2013. On Tuesday, cornerbacks coach Joe Whitt Jr. made that much clear. When players report back to Green Bay, four cornerbacks may engage in an open competition. Whitt praised the improvement of third-year corner Sam Shields and indicated that Shields, Tramon Williams, Casey Hayward and Davon House will all have an opportunity to start next season. Making things is interesting is Shields. After a strong finish this season, he may be ready to take on the opposition's top wide receiver next season. Upon returning from his high ankle sprain Dec. 9, Shields' performance "was comparable, if not better than Tramon’s in 2010," Whitt said. In 2010, Williams' string of big plays helped the Packers reach the Super Bowl. Of course, it was only one year ago Shields was plagued by missed tackles. Whitt said Shields cut his missed tackles by half this season and called him the best tackler on the team. In Shields’ final six games, he had 21 tackles, 11 pass break-ups and four interceptions. He opened up Green Bay’s loss at San Francisco with a pick returned for a touchdown. Whitt wouldn’t say that Williams -- the team’s No. 1 cornerback since 2010 -- necessarily had a down season. The coach said he still "graded out pretty well." But Shields’ finish and Hayward’s standout rookie season has made things interesting heading into next season. Excelling in the slot, the second-round pick from Vanderbilt finished fifth in the NFL with six interceptions. "Casey probably played better than anyone, and you all, expected him to play and probably played better than I expected him to play," Whitt said. "So the competition in the room has gotten better. So that’s the case. One by one, veteran offensive tackles are disappearing from the open market. And yet the Miami Dolphins, who hope to upgrade at the position, remain patient. With Sebastian Vollmer resigning with the Patriots, the assumption is the run on the few remaining available starters will begin shortly. That’s the hope of Eric Winston, the one-time Miami Hurricane lineman who is firmly on the Dolphins’ radar, but as of Monday, remained unsigned. The Dolphins are one of a handful of teams Winston has visited since being released by the Chiefs three weeks ago. 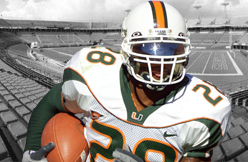 And while he declined to get into contract specifics, he did say he would be open to returning to South Florida. “Playing in the NFL is a privilege,” Winston said, who was at UM from 2003 through 2005. “Being anywhere would be nice. 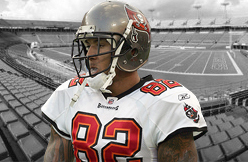 NFL.com's Ian Rapoport reported a week ago that the Oakland Raiders are interested in free-agent tight end Kellen Winslow now that his knee is in better shape than it was last season. Appearing on NFL Network's "NFL AM" on Monday, Winslow revealed he also has heard from the Cleveland Browns and Carolina Panthers. The Browns' interest is no surprise. 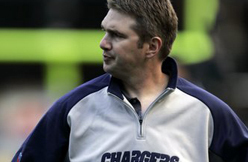 New coach Rob Chudzinski is tight with Winslow after coaching him at the University of Miami and in Cleveland. It remains to be seen if Winslow still is on the Browns' radar following their Kellen Davis signing. The Panthers have been looking for a second tight end to pair with Greg Olsen. Winslow "definitely" plans on playing in 2013, attributing his 2012 disappearing act to other priorities involving family matters. The key will be convincing the Raiders, Browns or Panthers that he's healthy and fully committed to football. UPDATE: The Plain Dealer reports the Browns are not interested in signing Winslow and have not reached out to the tight end about a potential reunion. According to The Plain Dealer's Mary Kay Cabot, the Browns plan to go with Jordan Cameron as their starter, with Davis as the No. 2 tight end. The Saints could be preparing to add a couple of former Pro Bowlers — albeit former Pro Bowlers who haven’t played at a Pro Bowl level recently. Both left tackle Bryant McKinnie and cornerback Nnamdi Asomugha are on the Saints’ radar, according to the New Orleans Times-Picayune. McKinnie hadn’t previously been linked to the Saints, but he said in an interview on WNST in Baltimore that the Saints have shown interest in him. A source told the Times-Picayune that there were “general” talks between McKinnie and the Saints, but nothing more than that. After losing Jermon Bushrod in free agency, the Saints would like to add a left tackle. McKinnie started all four postseason games for the Ravens and is now an unrestricted free agent. Asomugha has met with the Saints, and the Times-Picayune reports that the Saints view the choice of whether to come to New Orleans as Asomugha’s to make. 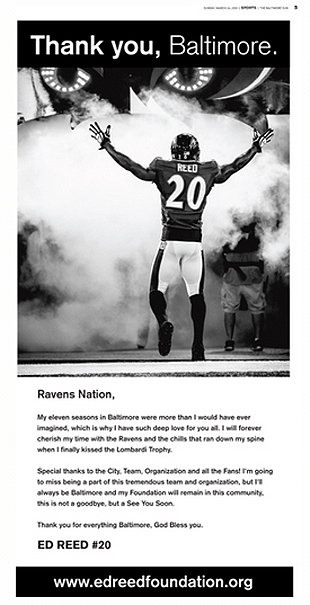 Days after signing with the Texans, former Ravens safety Ed Reed said goodbye to Baltimore, by taking a full-page ad out in the Baltimore Sun. It was a better investment than Ryan Kalil’s last foray into purchasing newsprint real estate. Under the headline “Thank you, Baltimore,” Reed expressed his gratitude to the city, after the team just let him walk away. “Ravens Nation, My eleven seasons in Baltimore were more than I would have ever imagined, which is why I have such deep love for you all,” the ad read. “I will forever cherish my time with the Ravens and the chills that ran down my spine when I finally kissed the Lombardi Trophy. “Special thanks to the City, Team, Organization and all the Fans! I’m going to miss being a part of this tremendous team and organization, but I’ll always be Baltimore and my Foundation will remain in this community, this is not a goodbye, but a See You Soon. “Thank you for everything Baltimore, God Bless you. Reed gets to walk away a hero in Baltimore, which may be better for his legacy than if he had stayed and played. He’s turning 35 in September, and might not look like the player Baltimore fans have grown to love for long. Former Patriots linebacker Ted Johnson has a radio show in Houston. Current Patriots defensive lineman Vince Wilfork doesn't live in Houston, which is why Johnson figured it was OK to talk about Wilfork's wife on Friday's show. Specifically, according to the Boston Globe's David D'Onofrio, a caller asked Johnson, "Of all of the players who he played with, who's got the ugliest spouse?" Turns out, the Internet extends beyond city limits. Which means that Wilfork very much heard Johnson's comments and let's just say he wasn't happy. "@TedJ52" is Ted Johnson, who wasted little time apologizing (via Twitter, naturally). "I just made a huge error in judgement and want to apologize to Vince and his wife for comments I made earlier today on a Houston radio show," Johnson said. … "Vince and his family are outstanding people who I have admired since they arrived in NE. I learned a big lesson today and feel terrible. … I have personally apologized to the family and feel awful. It was a huge error in judgment and I'm sorry for upsetting Vince's family. 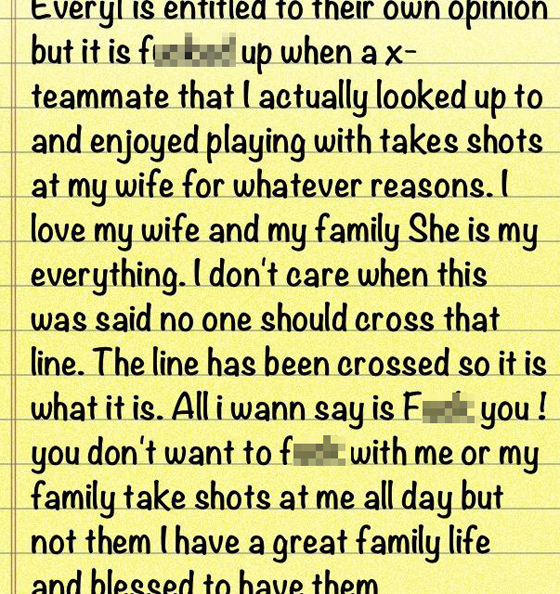 … The last thing I will say about this is that I understand the criticism [and] will own my poor decision." Let this be a lesson for us all: Never, ever publicly make fun of someone's wife, especially when said someone could literally squeeze you like a grape. If you are a fan of the Cleveland Browns, you couldn’t ask for a more passionate coach than Rob Chudzinski. While he wasn’t the flashiest option available – not by a wide margin – Chudzinski had something no other head coaching candidate had this offseason: a true love for the Browns. Oh, and the willingness to eat dog biscuits. Last week, Chudzinski told PFT Live that he was such a rabid fan of the Browns as a kid that he did, in fact, eat dog treats, along with watching the game outside to simulate being at the stadium. How Chudzinski performs as a head coach remains to be seen, but no one was going to enter this job with the kind of passion he brings. This story of a fan-turned-coach has been undersold, though it should gain plenty of traction as the season draws near. Especially if there are more dog biscuit-eating tales to be told. 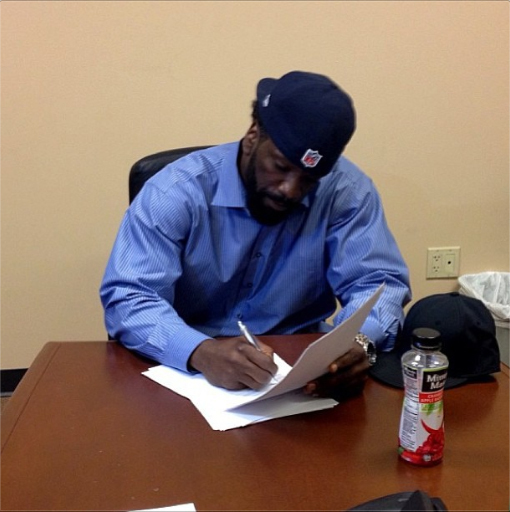 Ed Reed wore a Texans hat and jeans. He held up a No. 20 Texans jersey and posed for pictures. The longtime Baltimore Raven and future Hall of Famer officially signed his new contract, and was introduced to the media Friday afternoon. “Glad to be here. This is awesome,” Reed said at the start. He said Houston Texans General Manager Rick Smith called him on the first day of free agency, and that it was “just a matter of time before getting it done.” Reed thanked the Texans for rolling out the red carpet for him on his visit last week, which included being picked up by a private jet. “Anybody who is a football fan and knows me knows this is the right place to me, knows that this is the perfect situation,” Reed said. The Ravens reportedly did not offer Reed as much money as the Texans, who inked Reed to a three-year, $15 million deal with $5 million guaranteed. “It is hard, but football is a small chapter of our lives,” Reed said. “Eleven years is a great book. The way it ended, you can’t write a better script. Eventually, we knew Baltimore had to make decisions and they made those decisions. Reed was asked whether General Manager Ozzie Newsome would be the hardest person to leave. Reed said no, explaining it was everybody. “Football is what we do, it’s our job, it’s a business. But the relationships I have with people in Baltimore will never change,” said Reed, who emailed Newsome, Owner Steve Bisciotti and Head Coach John Harbaugh Friday morning. Reed joins a Texans defense that already touts a strong front seven led by reigning NFL Defensive Player of the Year J.J. Watt. He’ll be in the secondary with Pro Bowl cornerback Jonathan Joseph. Texans Owner Bob McNair said Reed was a target for the Texans because they wanted to add veteran leadership to help them in the playoffs, where they’ve lost two years in a row in the divisional round. Houston also lacked a playmaking center fielder, and McNair said the expectation is that Reed will help them compete against the likes of Patriots quarterback Tom Brady. Reed will travel back to Baltimore to face the Ravens during the 2013 regular season in what will be a highly-publicized reunion. He was visibly amped to join one of the league’s top defenses, and has already asked for his playbook. Despite having the latter portions of his own career derailed by a series of injuries, including one to his head, former Redskins great Clinton Portis has been an outspoken critic of new rules meant to protect players. In a pair of radio interviews, Portis argued that this new rule would cause more injuries, that it would continue the NFL’s transformation into a pass-all-the-time enterprise, and that the league will one day resemble flag football. The running back made a similar argument on SiriusXM NFL Radio. On 106.7, Portis was asked if he at least understands the NFL’s motivation of trying to protect players, and he wouldn’t even go that far. “I don’t, because there’s no way you can protect guys playing football,” he said. “There’s no way to protect guys playing a violent game. That’s the game of football. It’s violent. There’s no way to protect yourself. That’s what makes it America’s game. It’s like a gladiator sport, and the toughest team usually wins, or the toughest team is what people come out to appreciate. Now all of a sudden, you’re asking guys to kind of go out and play flag football. “You know, over the tenure of my career there were so many identity things taken away,” he continued. “The individuality, the Joe Horn and Chad Ochocinco, the Terrell Owens, the celebration, that went first. Then the team celebration went. Then the hitting defenseless guys, the jamming receivers. It kind of takes all the fear away from the game. You’re taking away the individuality and the fear…. And Portis argued, repeatedly, that more injuries would happen by asking players to change what they’ve always done. 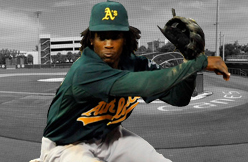 PHOENIX -- Jemile Weeks has gone from one of the favored few to one of the early exits at the A's camp. Weeks and outfielder Shane Peterson both were set to Triple-A Sacramento after Sunday's game. Both were hitting well, Peterson at .408 and Weeks at .370, but Peterson, a first-year Cactus League player, never had a chance of cracking an entrenched outfield. It was different for Weeks, who had bad luck on a couple of levels to wind up getting shipped back to the minor leagues. The second baseman got off to a hot start, but landed badly on his shoulder a week into the Cactus League and missed 1ï»¿1/2-weeks worth of work. By the time he got back, Eric Sogard had gone on a tremendous hitting tear, Adam Rosales was hitting well, too, and Jed Lowrie, the shortstop the A's got from the Astros in the Chris Carter deal, was locking down a roster spot. In the end, though, Melvin couldn't find as much playing time for Weeks once he came back from the injury, and the fact that Weeks is a second baseman and not able to play all over the infield like Sogard and Rosales worked against him. Weeks has an option, so he could be sent to the minor leagues. Rosales is out of options, and he's still with the big league club. The same is true for Scott Sizemore, who also is out of options and who also is still with the club despite a .171 spring average. And Sogard is just one of the spring training comets who streak through Arizona every so often. He's hitting .538 and has hits in 15 of his past 21 at-bats. Sending Sogard down -- now that would be tough. 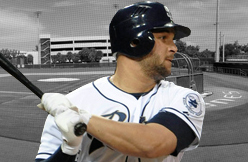 PEORIA, Ariz. - Yonder Alonso spent part of the offseason looking for more power in his swing. It turns out he just needed to wait a bit longer. Alonso hit his fifth home run in his last nine games and the San Diego Padres beat a split squad of Milwaukee Brewers 6-4 on Sunday. Alonso had two hits, scored twice and drove in three runs in another solid performance in his late spring surge. It's a positive sign for the 25-year-old first baseman, who hit.273 with 62 RBIs in his first full major league season, but had just nine home runs at a position where power is a job requirement. Following his offseason work, Alonso felt he didn't have to overhaul his swing. He thought his natural gap power would lift balls over the fence with better choices. "I did a lot of video work, and really dissected my swing to understand it better," he said. "I saw that I didn't have to change what I was doing. The power will come as I mature as a hitter and make better and better decisions at the plate. So far this spring, it's been working." Alonso has picked it up after he was 4 for 29 in his first nine spring games. On Sunday, he drove a 1-2 pitch from Wily Peralta in the fifth inning over the wall in right. 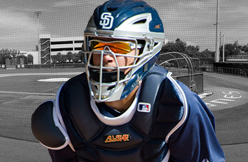 "Yonder has taken good swings over the last two weeks," Padres manager Buddy Black said. "The home run was nice, but I really like that it came with two strikes. He wasn't doing a good job of making two-strike contact early in spring, so this was an important at bat in that regard. "I also like that he wasn't trying to hit a home run in that at-bat. It's tough to try and generate home runs with his swing, and we're comfortable with where it is right now. If he makes good contact, the home runs will come on their own." With star third baseman Chase Headley out with a broken left thumb and left fielder Carlos Quentin recovering from knee soreness, Alonso is the Padres' only middle-of-the-order hitter with a full spring under his belt. That doesn't mean Alonso will try to carry San Diego's offense on his own. "I'm just one piece of a larger puzzle," Alonso said. "When you try and take on too much or assume more responsibility, you end up hindering your own progress. I'm just going to be me, and try to drive in runs whenever possible." 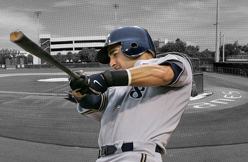 PHOENIX -- Ryan Braun said he is game-ready earlier than ever in spring training, then went out and proved it. Braun socked a home run in his first at-bat Saturday as the Milwaukee Brewers held on for a 2-1 victory over Oakland in their Cactus League opener at Maryvale Baseball Park. Because he will be leaving in a week to join Team USA for the World Baseball Classic, Braun accelerated his pre-camp workouts and plans to get more at-bats than usual in the interim. "I think I'm definitely ahead of where I am normally this time of year," said Braun. "I started my baseball stuff a lot earlier, so I feel pretty good." Braun looked quite comfortable at the plate in the bottom of the first inning when he drove a pitch from Oakland right-hander Jesse Chavez out to right-center. He walked in his next at-bat before exiting from the game. "Certainly, it's a good sign," said Braun. "I'd much rather homer than strike out, especially staying through the middle and hitting the ball the other way. When I'm going my best, that's what I do pretty well. "There's nothing I didn't like about it. It was a homer. Homers are cool. I always like homers." Ron Roenicke has watched some remarkable offensive exploits from Braun in his two seasons as Brewers manager but nevertheless shook his head at the first at-bat home run. "It's pretty amazing," said Roenicke. "With two strikes, he can do that. An amazing player. He just doesn't need as much as everybody else to get going. He's gifted to where he can do things other players can't do." Braun said he would play back-to-back games Monday and Tuesday, the earliest he ever has played consecutive contests in exhibition play. He knows he'll be counted upon to play nine innings right away when Team USA begins play in the WBC on March 8. "We'll have the luxury of three practices and two (exhibition games) prior to the WBC games," said Braun. "It's certainly more than I usually do but nothing drastic. "I'll be ready. Those games are fun. You get out there and you're wearing a USA jersey. Just the intensity of those games, I think I'll be prepared regardless of how many innings or at-bats I get here." The Brewers scored their other run on an RBI groundout by Jean Segura in the fourth inning, then let their pitchers take it from there. Eight pitchers limited the A's to five hits, with only Santo Manzanillo surrendering a run. The last two innings were covered nicely by Michael Olmsted (two strikeouts) and Jesus Sanchez (one), neither of whom allowed a hit. "Olmsted, man, that's a nice arm," said Roenicke. "I really like (Sanchez's) arm. He's very compact, short (with his delivery). The ball kind of jumps on you. I like what he does." Francona said that Perez can pitch every other day beginning Tuesday as Spring Training winds down, and then will throw a light ‘pen session on April 1, the day before the start of the regular season. In 57.2 innings last year, the right-hander posted a 3.59 ERA with 39 saves in his third season as the team’s closer. PEORIA, Ariz. -- The Padres trimmed their roster to 45 on Friday when they reassigned three players to Minor League camp. Right-handed pitchers Daniel Stange and Thad Weber and catcher Eddy Rodriguez joined the rest of the Minor Leaguers in camp. The three weren't on the 40-man roster and didn't have to be optioned. Rodriguez hit .308 in 13 at-bats over 14 games. He had one home run and knocked in three runs. The Padres could bring any of the players they've sent to the Minor League side over for Cactus League games in the next week. The team breaks camp Thursday before heading to San Antonio to play two games against the Rangers at the Alamodome.